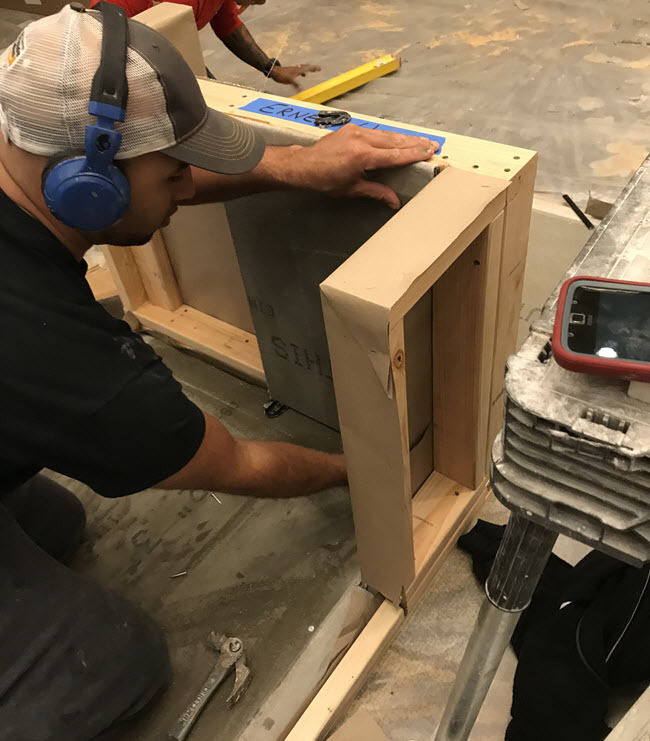 As the only tile industry-recognized third-party assessment of tile installation skill and knowledge, the Certified Tile Installer (CTI) program conducted by theCeramic Tile Education Foundation (CTEF) depends on support from the entire industry. Case in point: the first ever hands-on CTI test in New Jersey hosted by Schluter Systems. Here's how this event came about. When Mark Heinlein, National Tile Contractors Association Training Director, Technical Trainer and Presenter and CTI #1112, was working the East Coast portion of his Workshop Events, he met Ken Ballin of Skyro Floors who was looking for a Certified Tile Installer (CTI) hands-on test for himself, Carl Leonard and several other interested installers in the New Jersey Area. Unfortunately, even though Mark is a Regional Evaluator, he couldn't put the test together on such short notice while he was in New Jersey. He made sure, though, to connect Ken with Kevin Insalato, CTI Regional Evaluator Coordinator. In the meantime, Ken posted a message on the Tile Love 2.0 Facebook group. Shannon Huffstickler, Schluter Systems Territory Manager for New Jersey saw the post and immediately replied to him. 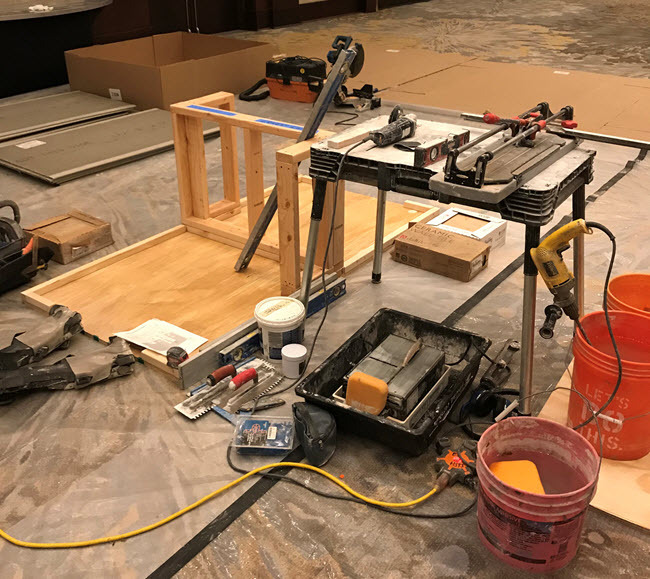 Shannon offered to host a hands-on Certified Tile Installer test in conjunction with a 2 Day Schluter Innovation Workshop in Mount Laurel, New Jersey. What motivated her was discovering that New Jersey had no Certified Tile Installers to whom she could refer work! Ken called Kevin and the first New Jersey CTI hands-on test event was born. Kevin brought in Jason Montgomery, the Regional Evaluator for this CTI Test. They and Shannon agreed to work hard to spread the word about the lack of CTIs in New Jersey. As you can see in the image above, Shannon created a Facebook Event that she promoted on the Tile Love 2.0 Group and Tile Geeks. She shared it on her personal page and on the Schluter Facebook page. 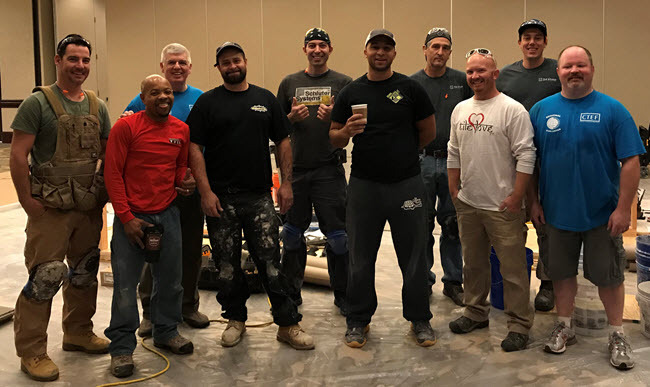 This first ever New Jersey CTI hands-on test was held on Friday, October 20th, 2017 at the Westin Hotel in Mount Laurel, New Jersey, hosted by Schluter Systems and Shannon Huffstickler. Eight tile installers took the test. All eight completed the test and also passed it and the written test. Carl Leonard, Pete Kwiatkowski, Bill Baillie, Robert Helm, EJ White, Sean Austerberry, Ken Ballin, Donald de la Pena. With them in blue t-shirts are Regional Evaluator Jason Montgomery and CTI Coordinator Kevin Insalato. 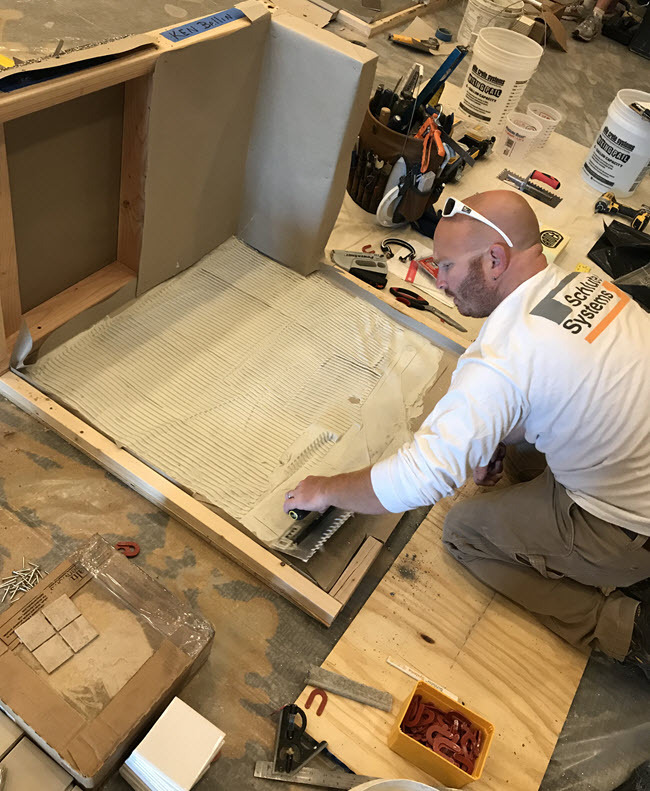 “Schluter Systems is a strong supporter of Qualified Labor. Tile certification is the best way for our installers to challenge themselves and become Certified Tile Installers. I set tile with my father and I’m considering taking the CTI Test sometime in the near future." This test is often referred to as "The toughest twenty-five square feet that you'll ever install." 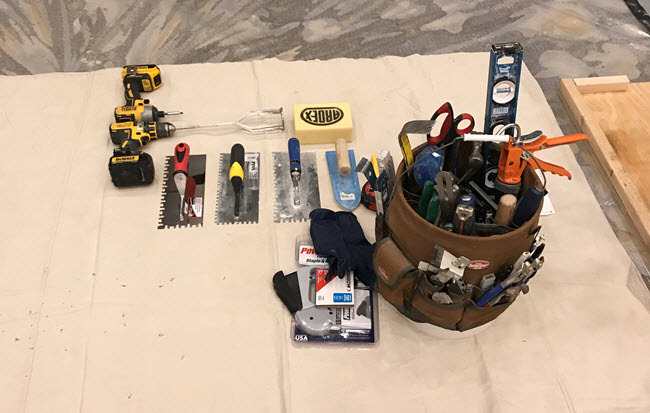 We caught up with Shannon both before and after the hands-on CTI test she and Schluter Systems hosted. CTEF: Shannon, how did you get started with tile? SH: My father and uncle are tile-setters and, as an adult returning to college in my late twenties (1998), I made extra money as a laborer for them in between classes. Being my father's only child, he spoiled me by overpaying me for sweeping, carrying boxes and sorting marble so, out of guilt, I asked him to teach me to do more so that I could feel like I was actually earning my pay. By the time I graduated (years later), I was still working with him as well as doing some jobs on my own and I discovered that I was already making more money setting tile than I would using my English/Writing degree in an entry level position at a publishing house. I had also by then fallen in love with the deep satisfaction that comes from working hard on a job with both my head and my hands so I had no desire to plant myself behind a desk anymore. I stayed with my father a while longer but soon fell in with a few high end residential builders who kept me busy on my own with intricate designs, unusual materials and challenging projects that really appealed to me. I registered my business under the name The Tile Girl and continued that adventure right up until Schluter hired me in 2012. I am now Territory Manager for New Jersey at Schluter-Systems North America. 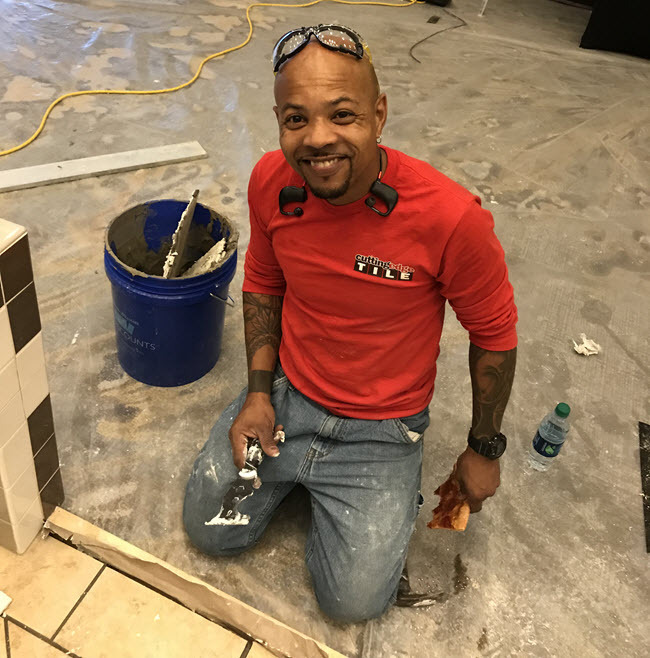 CTEF: You mentioned you want to become a Certified Tile Installer - why? SH: Since I don't set tile for a living anymore, if I ever were to get certified now, I would do it because it would be personally satisfying to know that the knowledge and skills I had accumulated during my years in the field were validated by a highly esteemed organization in the industry. Secondly, because I think it would benefit me in my sales position now for the tile setters I interact with to know that I've achieved that recognition. CTEF: Is your territory all of New Jersey? SH: Yes, I am the Territory Manager for all of New Jersey. I manage the Schluter Systems Distributor and Dealer relationships as well as all of the workshops we do here. CTEF: What other training plans do you have for New Jersey? SH: The current listing of NJ workshops is linked here, including one scheduled in Parsippany in January. I'm also working on some 1-day workshops in Saddle River that are not contracted yet - 2 in Spanish and 1 in English. CTEF: What surprised you the most about the experience? SH: I had witnessed testing a few times before so there weren't too many surprises although it's amazing every time that such a tiny square footage can take an experienced person all day - haha! I think the best surprise is that the entire class of 8 ALL passed, which I understand is quite rare! 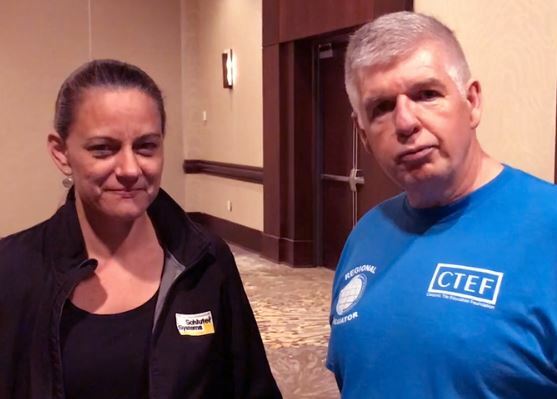 CTEF: Shannon, how can New Jersey tile installers contact you if they want to become certified? SH: My contact info is here Tel: 888-472-4588 x 4264, Cell: 732-977-6180 and email: shuffstickler@schluter.com. 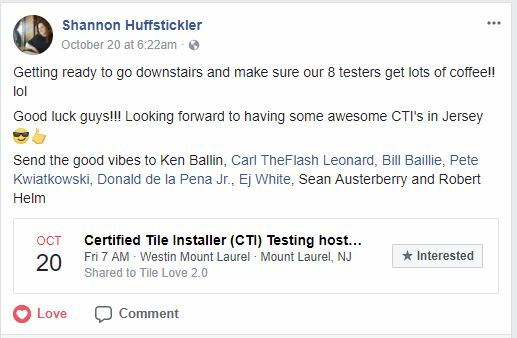 I'm very much looking forward to putting on future tests to grow the stable of CTIs in NJ so that I can use the CTEF site as a resource to the many people who call me asking how to locate qualified installers!! Here's the interview Kevin Insalato had with Shannon at the Westin Hotel in Mount Laurel, NJ. This group of contractors was pumped to be the first to participate in a New Jersey hands-on CTI test and were eager to pose for our cameras. You can tell from how this event came together that a tremendous amount of teamwork is required for these evaluations to happen once a group of installers is ready and interested in taking the test. From a CTEF Staff perspective, Scott Carothers, Kevin Insalato and Cathey McAlister work with the installers and the host location to register, schedule and align all of the moving parts. Special thanks to Shannon Huffstickler and Schluter for hosting this CTI hands-on test in New Jersey. Are you ready to become a Certified Tile Installer?